Solar cells with efficiencies above 20% and produced at low costs – perovskites make this possible. Now, researchers of Karlsruhe Institute of Technology (KIT) have gained fundamental insight into the function of perovskite solar cells. They found that bound states of electron-hole pairs can form during the absorption of light. Still, these pairs can be separated easily for current to flow. In addition, they enhance absorption. Work of the scientists is reported in the journal Applied Physics Letters. Perovskites are among the most promising materials for solar cells: When using them, the high efficiency can be combined with low-cost production. Photovoltaics research focuses on halide perovskites that contain both organic and inorganic compounds and, hence, are considered hybrid semiconductors. "In less than one decade, these perovskites underwent an outstanding development. Meanwhile, perovskite solar cells convert more than 20% of the incident light directly into usable current," says photovoltaics expert Dr. Michael Hetterich of KIT, who coordinates collaboration between KIT and the Center for Solar Energy and Hydrogen Research Baden-Württemberg (ZSW). The vast potential of perovskites is also obvious from tandem solar cells that combine a semitransparent perovskite top cell with a silicon or copper-indium-gallium-diselenide (CIGS) bottom cell. This allows for an optimal use of the solar spectrum. Current research challenges consist in enhancing the long-term stability of perovskite solar cells and replacing the lead they contain by environmentally more compatible elements. This requires deep insight into the structure and function of the perovskite layers. Researchers of the Institute of Applied Physics and the Light Technology Institute of KIT as well as of ZSW and Ludwig-Maximilians-Universität München study the function of thin-layer tandem solar cells based on perovskites under the CISOVSKIT (development of highly efficient hybrid solar cells from CIGS and perovskite materials) project funded by the Federal Ministry of Education and Research (BMBF). And they obtained new findings relating to the physical nature of the optical transitions. This is reported in a "Featured Article" of Applied Physics Letters. Optical transitions are changes of the energy state of electrons in a material by emission (release) or absorption (uptake) of photons, i.e. light particles. In his doctoral thesis, Fabian Ruf, who works in the group of Professor Heinz Kalt, KIT, points out that the fundamental optical transition in solar cells with a methyl ammonium lead iodide absorber, the classical halide perovskite, is of excitonic nature. This means that excitons may form in the solar cells after the absorption of light particles. Excitons are bound electron-hole pairs that largely determine the optoelectronic properties. Binding energy of the excitons has to be overcome in order to obtain free charge carriers and to make the current flow. By means of temperature-dependent electroabsorption spectroscopy, Fabian Ruf studied semitransparent solar cells with methyl ammonium lead iodide absorbers produced by Moritz Schultes of ZSW by a wet chemistry method. The results allow conclusions to be drawn with respect to excitonic transitions over the complete temperature range studied, from 10 Kelvin (-263°C) to room temperature. Depending on the perovskite crystal structure that changes with changing temperature, the exciton binding energy amounts to about 26 and 19 millielectronvolts, respectively. "Hence, the binding energy is small enough to ensure sufficient thermal separation of charge carriers at room temperature," Michael Hetterich explains. "In addition, the excitonic effects enhance absorption. 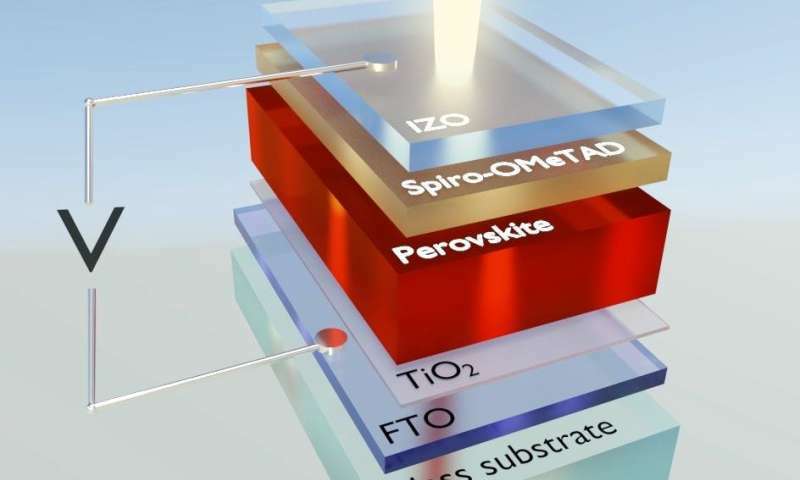 Both effects together enable efficient operation of the perovskite solar cell."